In my last post, I talked about how finding a wheelchair accessible taxi in NYC is only slightly easier than finding a unicorn. Well, I'm still searching for a unicorn, but I can officially say that I have ridden in a wheelchair accessible taxi in NYC, thanks to BraunAbility! BraunAbility graciously provided me with a wheelchair accessible taxi ride, free of charge, to the International Auto Show in NYC several months ago. Along for the ride was Michael O'Loughlin, who's somewhat of a taxi expert with his work in the passenger advocacy group Cab Riders United. He helped point out the features of the official Taxi of Tomorrow, the NV200, a vision made possible by the collaboration between Nissan and BraunAbility. 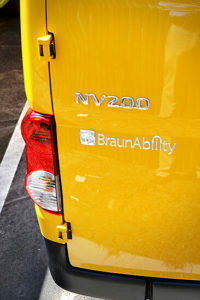 Accessibility: Nissan and BraunAbility's wheelchair accessible taxi isn't just accessible for wheelchair users. All taxis come pre-fitted with a hearing loop, a device that transmits sound directly to a hearing aid or cochlear implant. And the seatbelts and other key features of the cab have yellow markers to make them high-contrast and easier to see for those with visual impairments. Guidance up the ramp: This was the most unique feature of the taxi, and definitely my favorite feature. Ordinarily, with rear-entry vans, the wheelchair user first rolls up the ramp; once they are fully inside the vehicle, the driver attaches tie-downs to the wheelchair to keep it from moving during the drive. But with the NV200, the front tie-downs actually stretch out of the back door of the van and hook around your chair before you even get in the cab, guiding you up the ramp. I have spatial perception problems that sometimes make it difficult for me to position myself and roll up the ramp without fear of a wheel hanging off the edge. With the unique tie-down guidance of the NV200, I found it much easier to get up the ramp, and I felt much safer doing so. Two-way communication: The NV200 is equipped with an intercom that allows the driver to speak to the passengers. It can also allow the driver to hear what is going on in the backseat, so if you need to give your driver directions or ask him to turn up the heat, it's no problem. Don't want your driver listening in on private conversations? The driver can turn the feature on and off easily. My driver turned the intercom on and off several times during my trip. Lack of space: I have a small motorized scooter, which fit fairly easily in the NV200 wheelchair accessible taxi, but many people have large, bulky power wheelchairs that may have difficulty fitting in the cab (those with manual wheelchairs shouldn't have a problem, however). Wheelchairs are getting bigger and more elaborate, and NYC's Taxi of Tomorrow should reflect that. Access to screen and credit card reader: This is a problem that I have with all rear-entry accessible taxis, not just the NV200. When you're sitting in the back of the cab, you cannot access the taxi screen, which can show you news, weather, etc., and you cannot access the credit card reader. You also cannot see well enough to see the fare going up as you go, which makes it easier to pay your fare and calculate the tip at the end of your ride. If a wheelchair user wanted to pay their fare with a credit card, they would have to hand their card to the driver to swipe for them, while everyone else can swipe their own cards. That's not equality. Moreover, it's risky to hand your credit card over to a stranger. A second credit card reader positioned in the back at wheelchair height would be an easy solution. The Taxi and Limousine Commission of New York requested a rear card reader from Nissan, but an agreement was never reached. 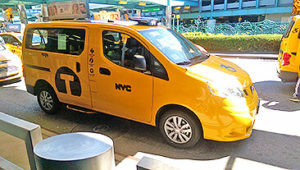 All in all, the flaws of the NV200 wheelchair accessible taxi are relatively minor, and the pros far outweigh the cons. The Taxi of Tomorrow looks promising and, with a few minor modifications, it can be even better. With proper driver training in the logistics of the cab, as well as some basic disability etiquette, the NV200 could truly be revolutionary. I thoroughly enjoyed my ride, and I am eagerly looking forward to the day when I can hail a cab on the street - just like anyone else. 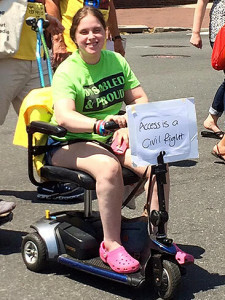 Cara Liebowitz is a disabled activist and writer who holds a M.A. in Disability Studies from the CUNY School of Professional Studies. She works for Everyday Feminism as a Contributing Writer, focusing mainly on intersectional feminism and disability. Cara serves as the co-chair for the Neurodiversity Caucus of the Society for Disability Studies and works with the Raise Advisory Partnership (RAP) creating materials to distribute to Parent Training Information Centers. In January 2016, she co-facilitated a writing workshop at the White House for disabled women and girls. Cara's writing has been published inEmpowering Leadership: A Systems Change Guide for Autistic College Students and Those With Other Disabilities,Criptiques, and will be published in the upcomingSpoon Knifeanthology from Autonomous Press. Cara blogs athttp://www.thatcrazycrippledchick.com.